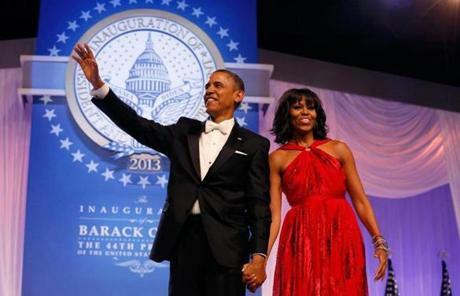 President Obama waved after his dance with Michelle Obama at the inaugural ball. 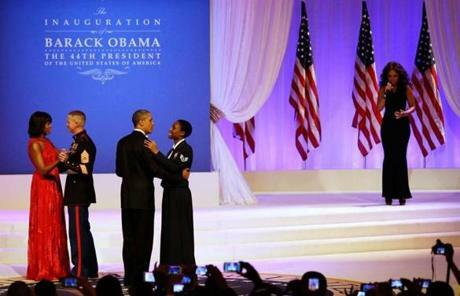 Jennifer Hudson performed while President Obama danced with Air Force Staff Sergeant Bria Nelson and Michelle Obama danced with Marine Gunnery Sergeant Timothy Easterling. 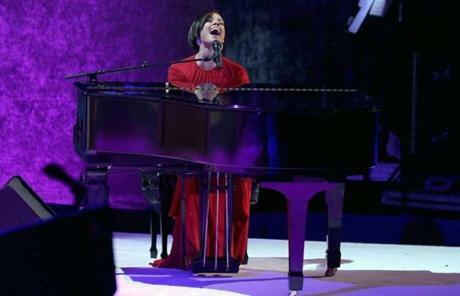 Alicia Keys performed at the inaugural ball. Vice President Joe Biden and Jll Biden reacted to the crowd at the inaugural ball. 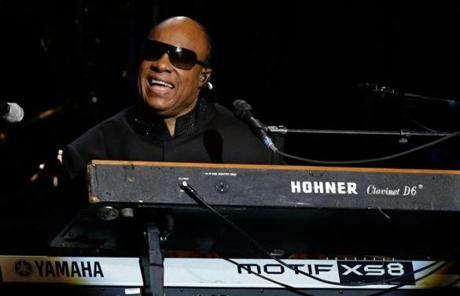 Stevie Wonder performed at the ball. 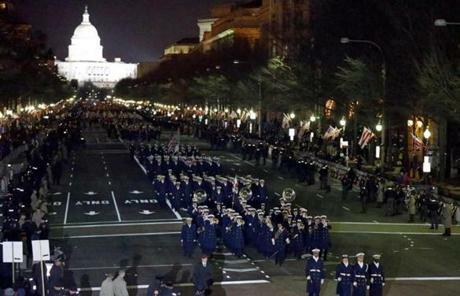 Members of the US Coast Guard marched in the inaugural parade. 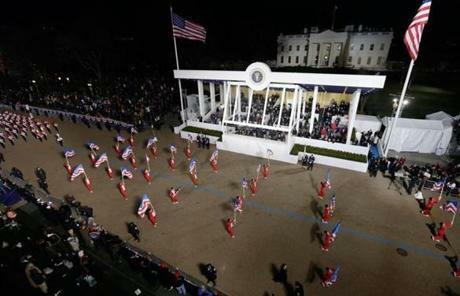 The Boston Crusaders Drum & Bugle Corps performed while passing the presidential box in the parade. 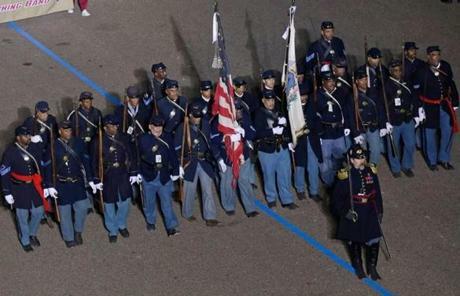 The 54th Massachusetts Volunteer Infantry Regiment, Company B, Maryland, passed the presidential box during the parade. 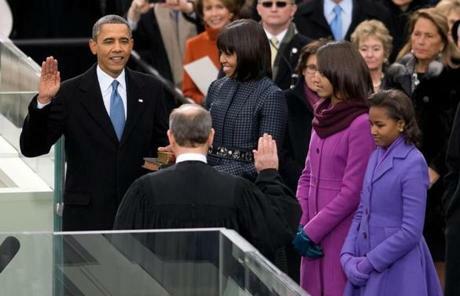 President Obama took the oath of office from Chief Justice John Roberts. 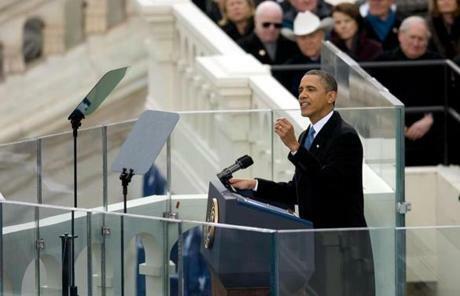 President Obama delivered his inaugural address from the steps of the US Capitol. 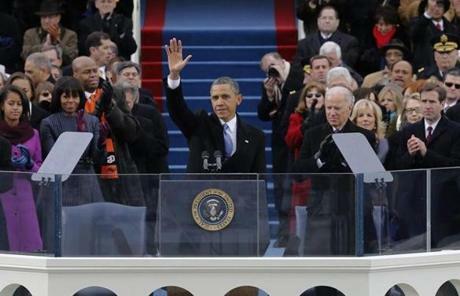 President Obama waved to the crowd at the inauguration. 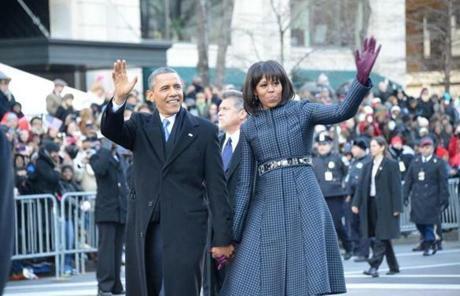 President Obama and wife Michelle waved during the inaugural parade. 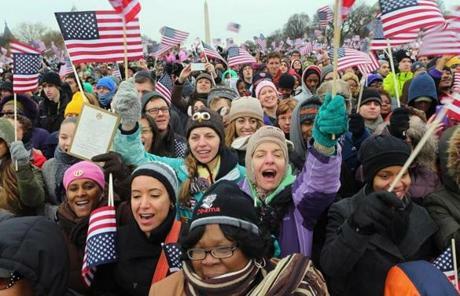 Supporters waved flags and cheered during the ceremony. 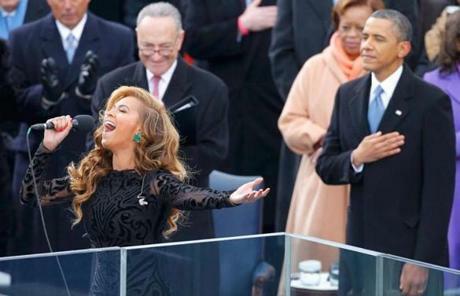 Beyonce sang the national anthem. 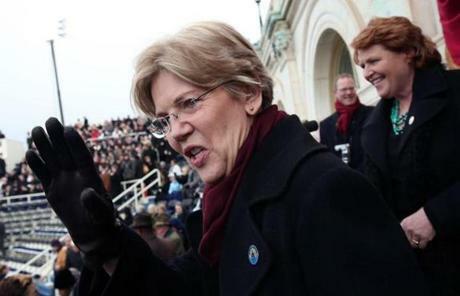 Senator Elizabeth Warren attended the ceremony. 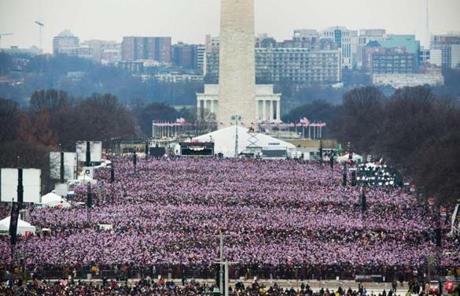 Hundreds of thousands of people packed the National Mall for the event. 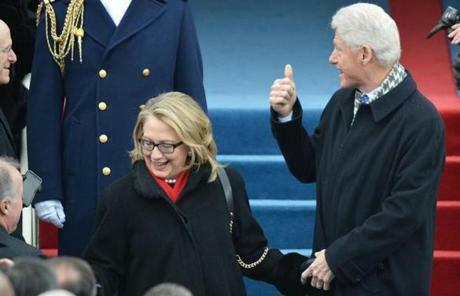 Hillary and Bill Clinton greeted others at the ceremony. 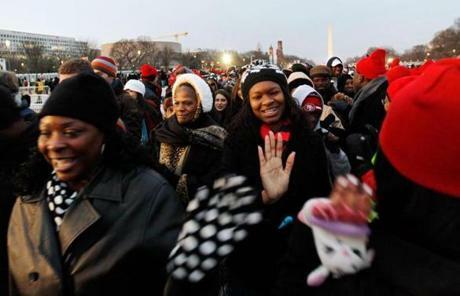 Supporters gathered in crowds for the ceremony. 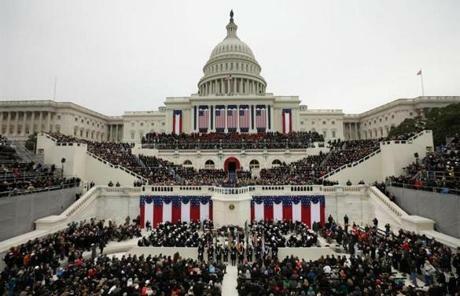 The Capitol building was decorated with flags for the ceremony. 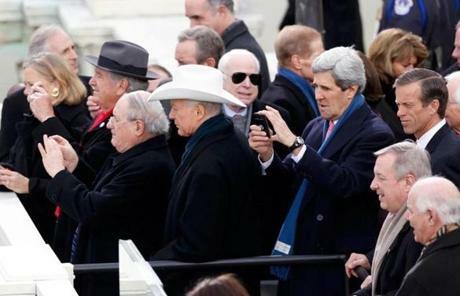 Senator John Kerry of Massachusetts took a photo.